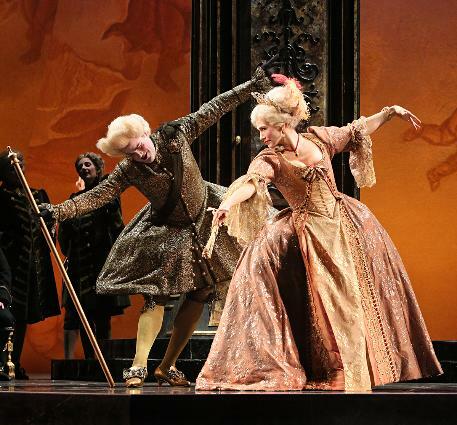 Dust off your bow-ties and stilettos, the Minnesota Opera Season has officially begun! 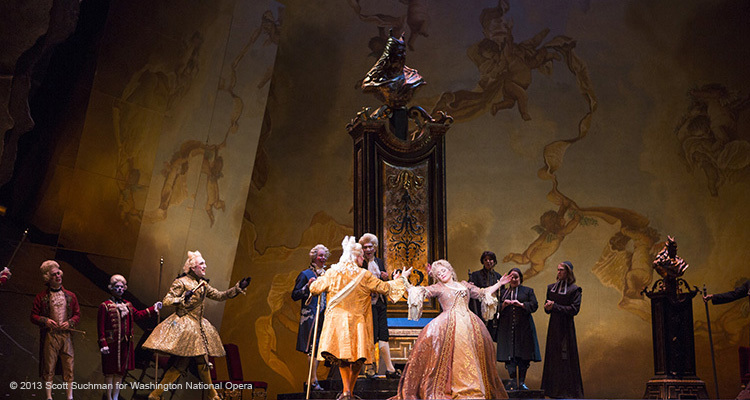 The 2013-2014 season kicked off this past Saturday, September 21st with Puccini’s Manon Lescaut. Minnesota Opera favorite, Kelly Kaduce, starred in the role of Manon. Dinyar Vania played opposite Kaduce in the role of The Chevalier des Grieux. The wealthy antagonist, Geronte de Ravoir was played by Andrew Wilkowske. Also, not to be missed, MN Opera Resident Artist Matthew Opitz played the role of Lescaut, Manon’s brother. As I have come to expect from the MN Opera, the talent of the cast was exceptional. Certainly, not to be overlooked was the massive chorus involved in this production, not to mention the talented orchestra that consistently supports the opera so well. While I could speak at length to the talent of the musicians, it was the work of the artistic staff that took my breath away. The set, lighting, and costumes were gorgeous. Within the story, the multiple settings were often starkly contrasting, whether it were the beautiful home of Geronte or the barren desert of Louisiana. The set design maintained a common theme while beautifully expressing each location. A lovely touch was the subtle use of mirrors in Geronte’s home as a representation of Manon’s vanity. The use of projection was also a notable feature. Text was projected onto, essentially, a giant piece of parchment, allowing for the story to continue between set changes. Visually, this production was beautiful and engaging, serving as a continuation of the story being told on stage. Manon Lescaut was a perfect way to begin the 2013-2014 season. It was a slap in the face reminder of my love for opera. Cheers to a great season to come! Recently, I traveled to New York City for a work conference and was able to fly out a few days early to visit friends, wander the city, and catch a show! If I had all the time and money in the world I would go to NYC and sit in theaters watching shows. Alas, this was not the lot I was dealt, so I was tasked with the selection of one show for this trip. The group I was with gave a communal ‘yes’ to Newsies, so Newsies it was. Our first go at tickets involved a trip to the TKTS booth in Times Square. Before we went to the booth we had decided on a price we were willing to pay, and unfortunately we walked up to the booth to find that the ticket price was beyond what we had wanted to pay. This put us in a tough place. I was in NYC, I couldn’t leave without seeing a show! The guy behind the glass window at the TKTS booth suggested we give the theater itself a try, so to the theater we went. As we walked up to the theater the skies parted and a single light shone down onto a table containing slips of paper and a lottery cage. (That’s how I remember it anyway…) We asked the man behind the table what the deal was and he explained that they have a lottery before shows for $30 tickets. (!!) Typically they have around 200 people who have a try at the lottery, but that night there were ten of us. That meant we were all guaranteed tickets. (!!!) 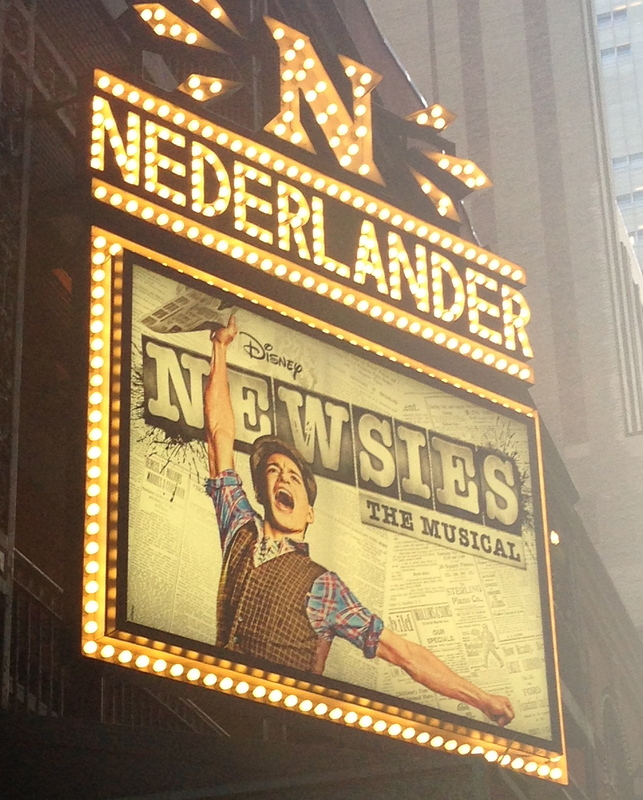 So that night I saw Newsies. On Broadway. For $30. Honestly, it blew my expectations out of the water. Knowing this was a Disney production, I anticipated that it would be well done, but was hesitant whether or not it would have any substance. It was a kid-friendly show, and it had the occasional cheesy moment, but it was believable. Corey Cott as Jack Kelly effortlessly sang, danced, and acted while running up and down three sets of stairs. Also, this is his Broadway debut! Say whaaaat?! He has an amazing future ahead of him. Really, the entire cast was outrageously talented. It’s no wonder the show won the 2012 Tony for best choreography. If you have the opportunity to catch it when visiting NYC, I highly suggest it! Some friends, Alyssa & Andrea gambling, Broadway style. Side note: I don’t know ifI ever mentioned this, but my Pumps & Playbills counterpart, Karyn, moved to Denver in June. Sad, I know. 😦 Well, she happened to be in NYC at the same time (crazy, I know) so we had a long-awaited reunion which included catching Newsies!